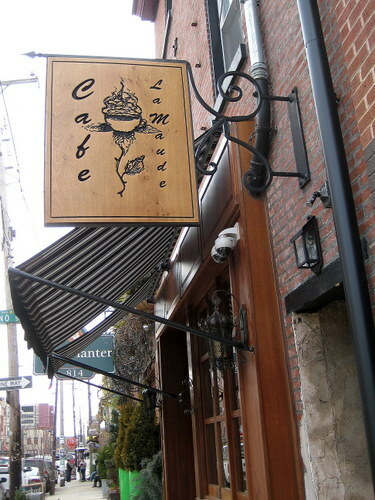 After many thwarted attempts, I finally got a chance to brunch at Cafe La Maude in Northern Liberties. It’s down a few steps from the ever popular Honey’s, but it’s a completely different experience. It’s cute on the outside, and it’s probably even cuter when it’s warm and the front windows are open and there are tables outside. But omg, the inside is just so sickeningly cute and awesome. I mean, seriously. It’s so amazing and well-done and beautifully designed it makes me want to cry. If I could dream of a kitchen and dining room, it would look like Cafe La Maude. I would also be filthy rich in order to be able to afford it. It’s totally european chic and cool on the inside. Grey subway tiles! I love it! 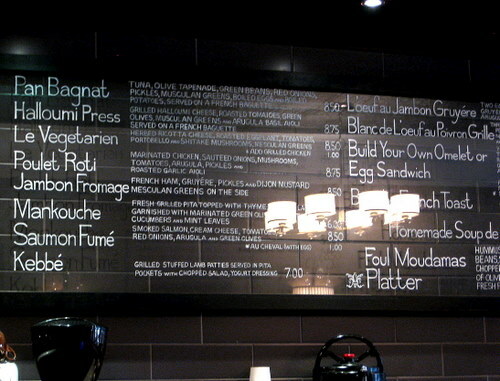 It’s a cafe so the menu is fairly small, consisting of some breakfast items, sandwiches, and salads. There’s also pastries and coffees. The fare is french-lebanese, so you’ll see a nice mix of middle-eastern and french favorites. Really though, can I just say again how attractive this place is? Here is the Saumon Fume. 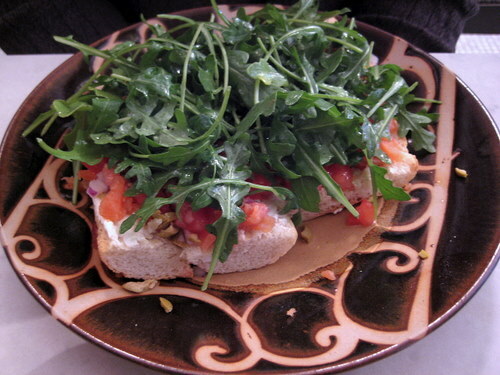 It is an open-faced sandwich with smoked salmon, cream cheese, tomatoes, red onions, green olives, and an overflow of arugula. This sandwich was enjoyed quite a bit, until J bit into an olive pit and almost broke a tooth. That kind of put a downer on it. Also, he asked for an egg to be added on but there was no such egg! Oops. But otherwise, a good sandwich. I got the Halloumi Press. 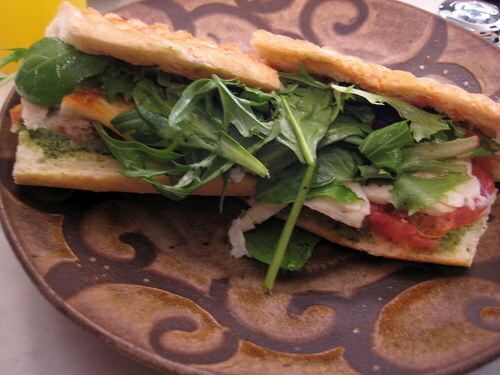 It was a grilled halloumi cheese sandwich on baguette with roasted tomatoes, green olives, mesclun greens and an arugula basil aioli. I fell in love with halloumi cheese ever since having it at Kanella so I really enjoyed this sandwich. This halloumi was actually quite salty though, so don’t expect anything bland. We also tried an oj/lemonade mix drink that had a slightly odd taste to it. Not odd bad, just odd. I felt like it was flowery, like a honeysuckle taste? In any case, we liked it! The service was ok. We had to wait quite awhile for the food, and people that were seated after us got their food before us, which wasn’t that cool. But the atmosphere is too great to let that bother you. It’s definitely a place to just hang out and linger with friends. I’ll wait for my sandwich if I can just soak in how lovely this place is. If only I could go home and my home was this lovely!